This book is the third volume in a series that provides a hands-on perspective on the evolving theories associated with Roger Schank and his students. The primary focus of this volume is on constructing explanations. All of the chapters relate to the problem of building computer programs that can develop hypotheses about what might have caused an observed event. Because most researchers in natural language processing don't really want to work on inference, memory, and learning issues, most of their sample text fragments are chosen carefully to de-emphasize the need for non text-related reasoning. The ability to come up with hypotheses about what is really going on in a story is a hallmark of human intelligence. The biggest difference between truly intelligent readers and less intelligent ones is the extent to which the reader can go beyond merely understanding the explicit statements being communicated. Achieving a creative level of understanding means developing hypotheses about questions for which there may be no conclusively correct answer at all. The focus of the lab, during the period documented in this book, was to work on getting a computer program to do that. * Retrieve an explanation that might be relevant to the anomaly. * Evaluate whether the retrieved explanation makes sense when applied to the current anomaly. * Adapt the explanation to produce a new variant that fits better if the retrieved explanation doesn't fit the anomaly perfectly. Contents: Preface. Part I: The Framework. The Explanation Game. The Explanation Process: Explanation Questions and Explanation Patterns. Part II: Detailed Investigations. 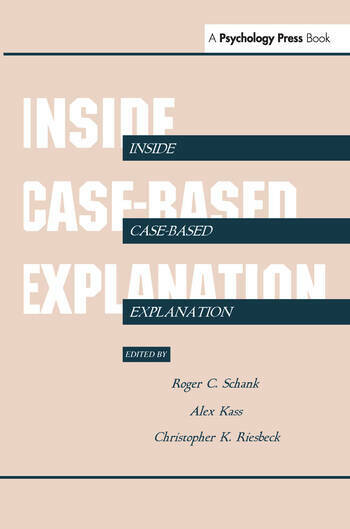 An Overview of Case-Based Explanation. C.C. Owens, Retriever and Anon: Retrieving Structures From Memory. E.A. Domeshek, Abby: Exploring an Indexing Vocabulary for Social Advice. D.B. Leake, ACCEPTER: Evaluating Explanations. A. Ram, AQUA: Questions that Drive the Explanation Process. A. Kass, Tweaker: Adapting Old Explanations to New Situations. E.K. Jones, Brainstormer: Refining Abstract Planning Advice. Part III: Sample Implementation. Micro Swale. "...a fresh approach to an age-old question: What is it that makes humans intelligent?....offers a promising new view on the nature of intelligence..."
"...the book provides a very informative overview of case-based explanation....thought provoking, and the general principles behind the model of explanation (and indeed understanding per se) are highly appealing."